One thing that I have learned from reading Bethany and Lindsay's post on this is that there are SO many different types of hair. We each are so intricately different. My hair is very strait, shiny, and thick. I try to go as long as I can without washing, but my hair get's oily quite fast. I've been using dry shampoo for years and love it, it helps absorb some of my hairs oils and gives it a bit more texture than it's natural flat state. If I wash my hair at night I usually need to add a bit of dry shampoo in the morning to my fringe and the roots. My hair is weird and I hate it on day 1, clean hair is just too fresh for me! I don't really have a favourite shampoo, at the moment I'm using an Trader Joe's shampoo and because my hair isn't long enough to get any crazy knots, I don't use conditioner. My favourite dry shampoo is Pink House, I love that it's for darker hair, a lot of dry shampoo's are white, making it harder to blend into my hair. I Blow dry my hair for a few minutes just to add a little heat, and because my hair absorbs so much moisture, blowdrying it helps to dry it out that extra bit. Day 2 I usually don't need to do much, sometimes i'll add a few loose curls for extra texture and volume, and I usually keep it down. I don't use a lot of product, either some beach texture spray for volume, or hairspray to keep my bangs in place. Day 3 my roots are starting to get a little oily so I will add some more dry shampoo and do a little backcombing to the roots and throw it into a pony or half up. It helps it last longer too because when it's down I find I'm touching it a lot more which makes it get greasy a lot faster. Day 4, i usually throw my hair up into a top knot, my bangs are usually still fine, but if they're not i'll just pin them up along with the rest of my hair. My hair is quite thick so I think that helps with it not looking or getting too greasy. I can sometimes (depending on what I'm doing those days) go a few extra days throwing it up in a knot and not worrying about it too much! At this point I usually try to hold out a few extra days without washing because I know it's so good for my hair. If my hair is not still in a top knot, or if i want something a little more put together, a low bun always does the job. It helps keep it looking fresh by adding a little dry shampoo to the roots, and backcombing around the crown. If the front pieces are either too greasy or "uncontrollable" as a result of being pinned back the day before, the side part always does the trick. Doing a thick side part and twisting it across your forehead is a great trick for getting those bangs out of your face, it is also a great style for the awkward growing out phase. My hair is a little less complicated than others, and really easy to maintain. If you have any questions or suggestions I would LOVE to hear them! 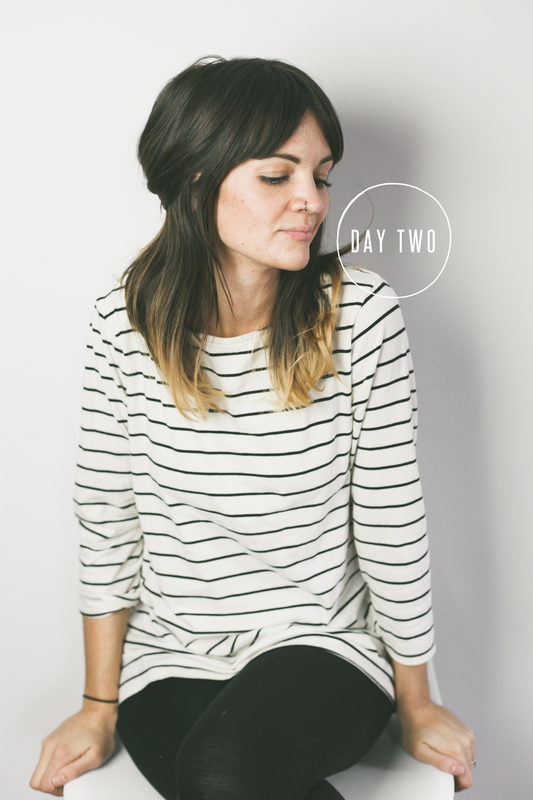 Read Lindsay & Bethany's posts on a week without washing!